Rent an Italian vacation villa, farmhouse or apartment - it's easy! For a very special holiday in Italy, spend some time with us and review one of the most complete catalogs on the web for Italian vacation rentals. We offer an impressive collection of Italian villas, farmhouses and apartments in the most desirable regions for your Italy stay. An Italian villa rental offers great advantages, especially if you desire a close personal experience with the people and countryside of Italy. 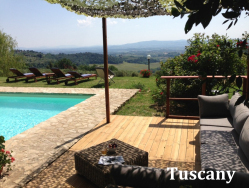 Take in the views from a Tuscany villa, visit the nearby towns like San Gimignano, Siena or Florence. Or maybe you would prefer to relax with a view of the Cinque Terre coastline, or along the waters of Lake Como, Maggiore or Orta. For the experienced traveler, find an Italy rental off the beaten path in small and less visited areas in the Tuscan countryside, Umbria or even Puglia. From a vacation rental property in Italy, you can set your own schedule, take day trips to find the best small towns, vineyards, local churches, museums and restaurants. At the end of the day, return to your own villa to the privacy or your own place and relax by the pool. Spend the day at the market and come home to your Italian kitchen, pour a glass of wine and create your own culinary masterpiece. You can also find the perfect Italian vacation apartment rental here in the most popular locations in Italy. A Florence apartment rental offers you a marvelous opportunity to visit the Uffizi, the Ponte Vecchio and other sites and then return to your own cozy refuge for a little rest! Many Italian holiday apartment rentals offer easy access to the hill towns and villages that give Italy its characteristic charm. Apartment rentals are also available in smaller towns and out of the way places -- take a look! Search for an Italian villa rental by region - Visit our easy search page to select your area of Italy and enter your dates and preferences. You can review a list of available properties and send us an inquiry or reservation request. Want some help from our Italy experts? Complete our quick contact form - We enjoy hearing from people who are planning a trip to Italy and would like to rent a vacation property. Let us know a little bit about what you would like to do and we will take it from there!